Found one file extension association related to FLOWCAL Desktop and 1 file format developed specifically for use with FLOWCAL Desktop. 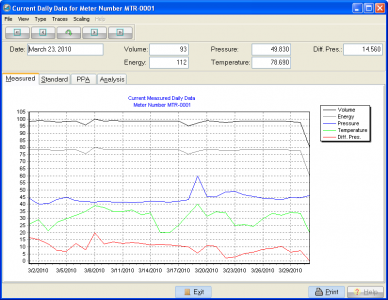 Developer / company: Flow-Cal, Inc.
FLOWCAL Desktop gas measurement software and liquid measurement software is ideally suited for applications with numerous flow computers where only a single user needs access to the data. Desktop utilizes the personal Oracle database which prohibits external connections. The program is ideally suited for applications with numerous flow computers where only a single user needs access to the data. As with the Lite version, Desktop utilizes the personal Oracle database which prohibits external connections. If you need more information please contact the developers of FLOWCAL Desktop (Flow-Cal, Inc.), or check out their product website.